You can play Rummy with two or more players (for six or more players, you need a second deck of cards). You’ll also need a paper and pencil for scoring.Learn how to play Rummy and other basics including rules, scoring, and how to win! 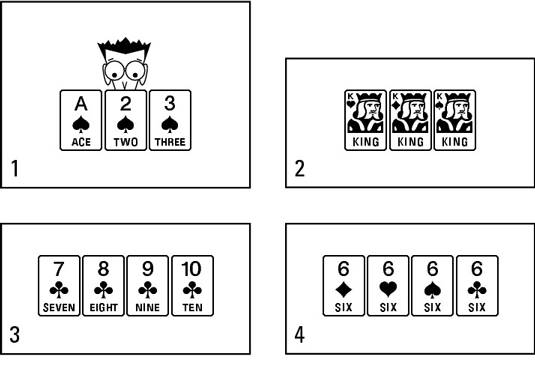 In most Rummy games, unlike the majority of other card games, aces can be high or low, but not both. So, runs involving the ace must take the form A-2-3 or A-K-Q but not K-A-2. Each player is dealt a certain number of cards from the deck. When playing Rummy with two, three, or four players, each player gets ten cards; when playing with five players, each player gets six cards. With more than five players, you must use two decks of cards and a hand of seven cards. The two-player game can also be played with seven cards each. When you pick up a card from the stock that you don’t want, don’t throw it away immediately. Put the card into your hand and then extract it. No player, regardless of skill level, needs to give gratuitous information away. You can play Rummy with wild cards by adding Jokers to the deck, or you can make the 2s or some other number wild. You can substitute the card represented by a wild card when it is your turn to play. So, if a combination including a Joker, standing in for the King of Clubs is put on the table, the next player can put in the King of Clubs and pick up the Joker for use elsewhere. 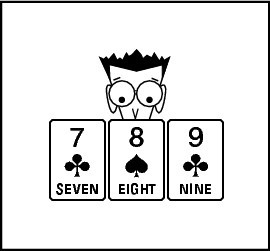 If you put down two eights and a joker, you do not have to announce which eight the joker represents, but with a run such as 5-6-Joker, the assumption is that the joker represents the 7. When playing with wild cards, you may not want to put combinations containing wild cards down immediately; you don’t want to give another player the use of a wild card by way of the substitution. Of course, if you feel obliged to put down the set or run, try to ensure that the card your wild card replaces has already been played in some other set or run.